1. In a large bowl, mix yeast and salt into 3 cups warm water. Add flour, and stir to combine completely. Let dough rise in a warm place for at least two hours, until it rises and collapses (up to 5 hours – or even overnight won’t hurt it). The dough may be baked at this point, or refrigerated for later use. 2. Cover dough, but make sure it is not airtight – gases need to escape – and place in fridge. When you are ready to use it, throw a small fistful of flour on the surface and use a serrated knife to cut off a piece of the size you desire. (The authors recommend a 1 pound loaf – which means cutting off grapefruit-sized piece of dough). Turning the dough in your hands, stretch the surface of the dough and tuck in under. The surface will be smooth, and the bottom with be bunched. 3. Dust a pizza peel (or any flat surface – I use a rimless cookie sheet) with cornmeal. (This prevents sticking, and adds a nice, rustic crunch. You can use flour instead, but you’ll need to use a very generous dusting). Allow dough to rest in a warm place for 40 minutes – longer (up to an hour and a half) if you use some whole wheat flour in place of the white, or if you make a larger loaf. 4. Twenty minutes before baking, preheat oven to 450 degrees with baking stone (or overturned baking sheet) inside on the middle rack, plus a shallow pan on the top rack. Throw a small fistful of flour over the dough, slash it 2-4 times with a serrated knife (in a cross, a tic-tac-toe, or a fan), and slide it into the oven, onto the baking stone. Throw 1-2 cups of tap water into the shallow pan, and quickly shut the oven door to trap steam inside. 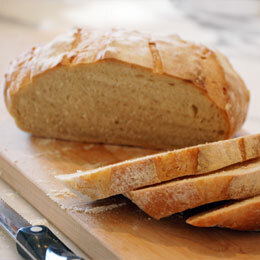 Bake for 30 minutes, or until crust is well browned and bread sounds hollow when you knock on the bottom.